When companies or organizations begin a project, the most important thing is to keep the whole project organized in order for everyone involved to be able to carry it outwithout a hitch. 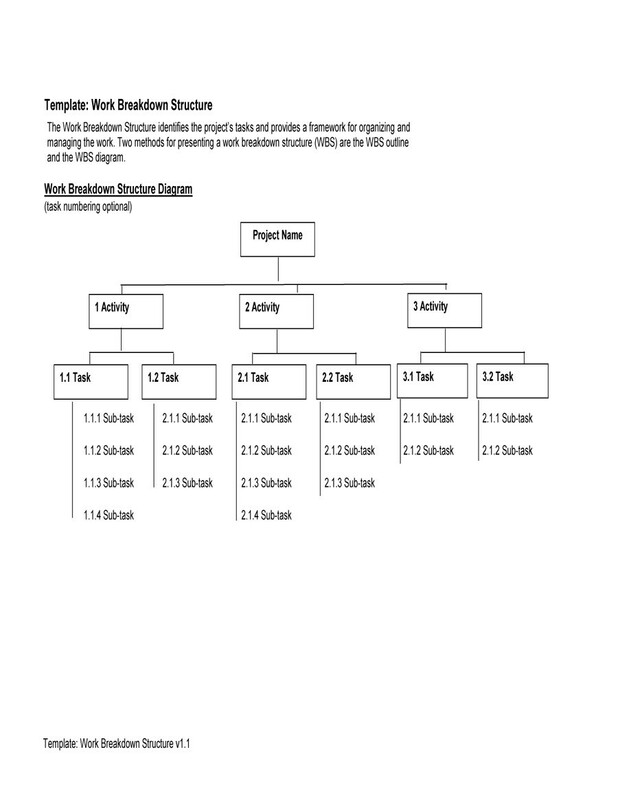 This is when making a work breakdown structure or a work breakdown structure template is essential. 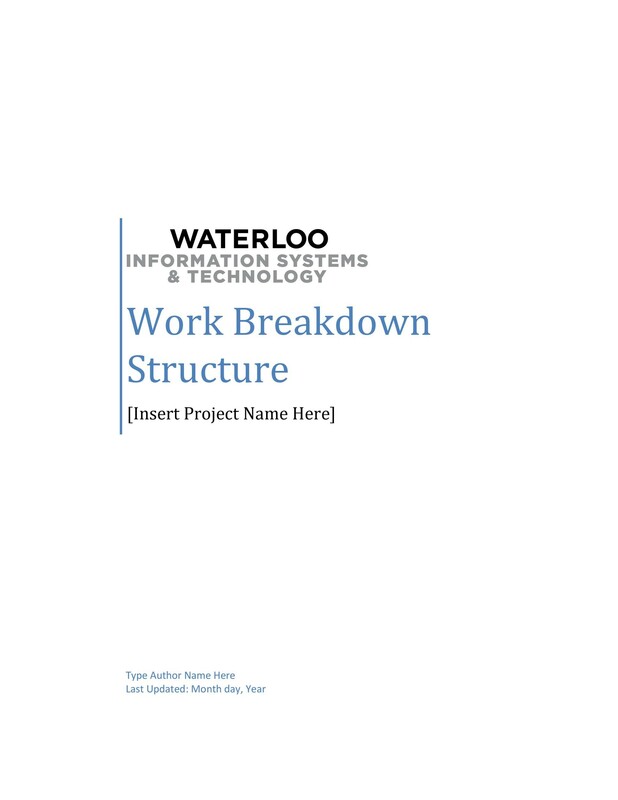 To put it simply, a work breakdown structure or WBS is an essential project deliverable which is used to systemize the work of the team into sections which are easier to manage. 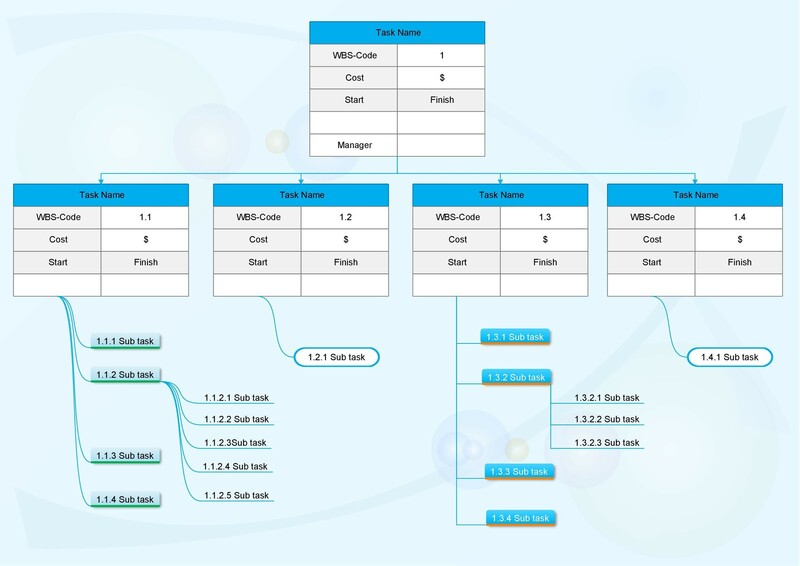 A good WBS template would be a visual definition of the whole project scope which divides it into manageable parts which would be more understandable to all the members of the project team. 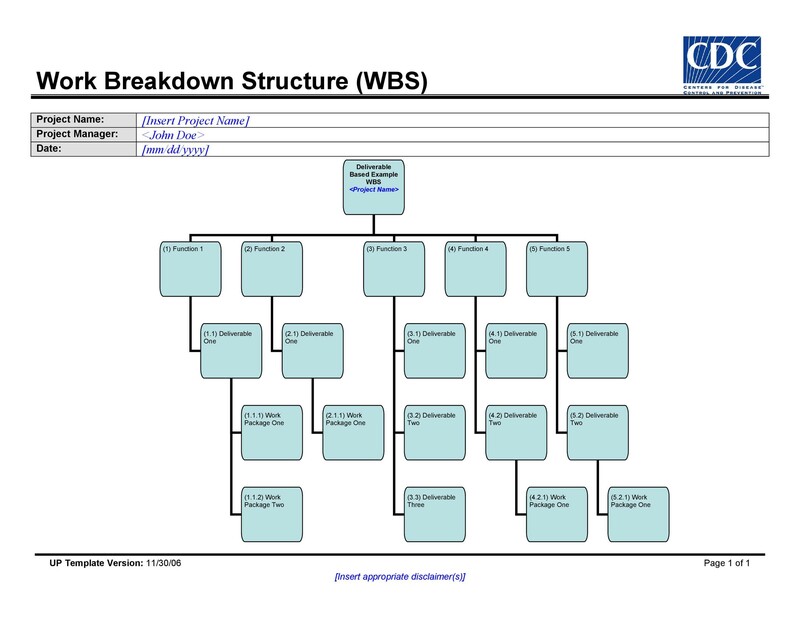 Each level of a WBS would give enough information and more details, thus making it much more comprehensive. 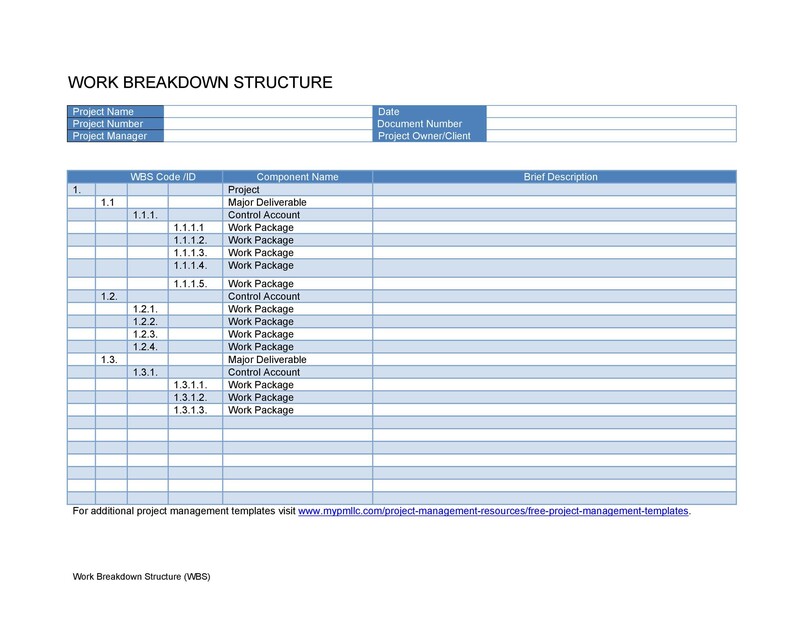 If you had the chance to see an actual work breakdown structure example, you may even see it as an outline or a map of the whole project. 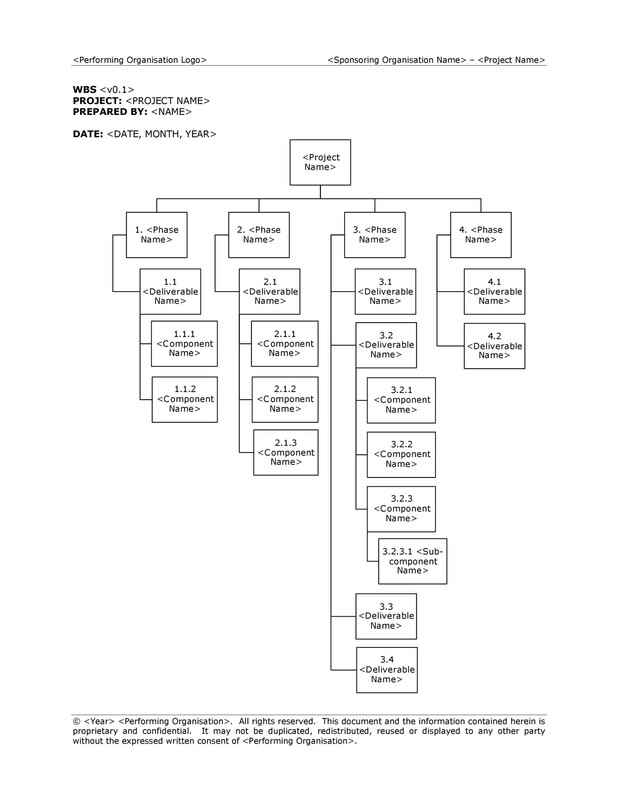 The whole structure would start with the top-level deliverable then would continue on to smaller sub-deliverables in a hierarchy. 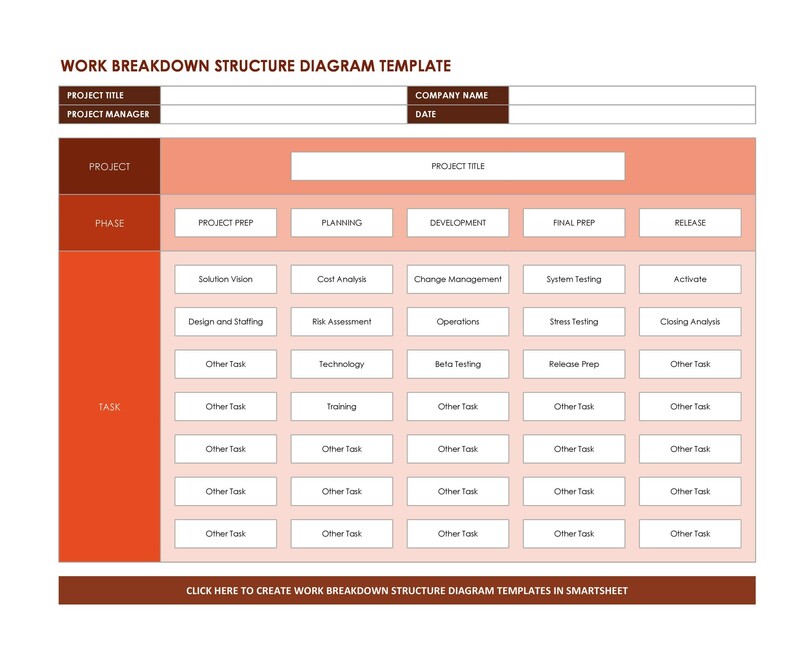 The work breakdown structure is made by the whole project team first by establishing the most important deliverables then dividing those deliverables into smaller, more manageable parts and sub-deliverables. These smaller parts are then broken down further until a single team member can be made in charge of it. At the very bottom, the tasks of each member are specified so that when the project starts, the work starts from the very bottom, gradually working its way to the top until the project’s completion. 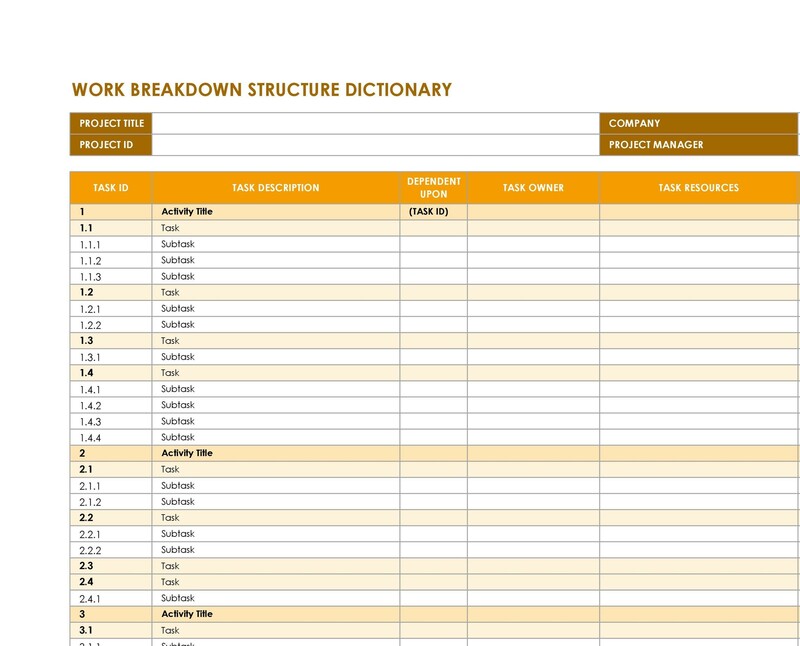 In this article, you will learn everything you need to know about work breakdown structures such as the different types, benefits and even some guides and steps on how to make your own template. If you’re planning to start a project in your company, you would benefit a lot from learning all this information. First, let’s learn about the different types of WBS. 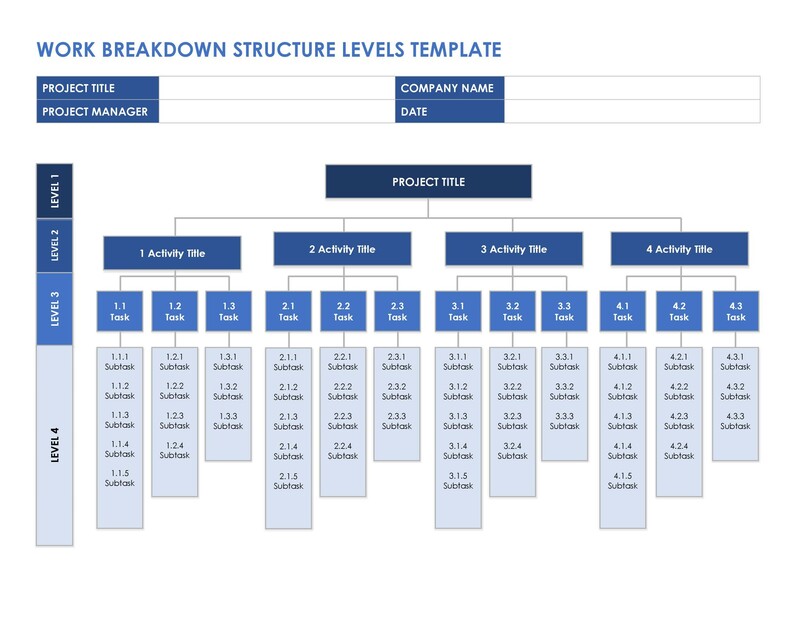 There are different types of work breakdown structure templates and they are made according to the main focus of the project. Since WBS is basically diagrams or easily understood maps of illustrations for a project, a lot of different types can be made. 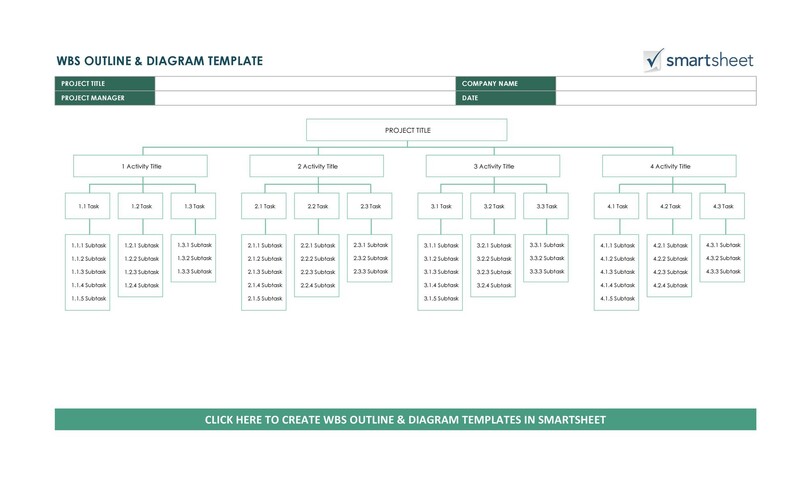 Let’s take a look at the different types of WBS templates which you can adapt to your company or organization. This is an action-oriented type of WBS. This type establishes the project work deliverables in terms of the actions which are needed to be performed so that the deliverable can be produced. In every element of this type of WBS, a verb is the first word used such as develop, transfer, design, etc. This is an element oriented type of WBS. 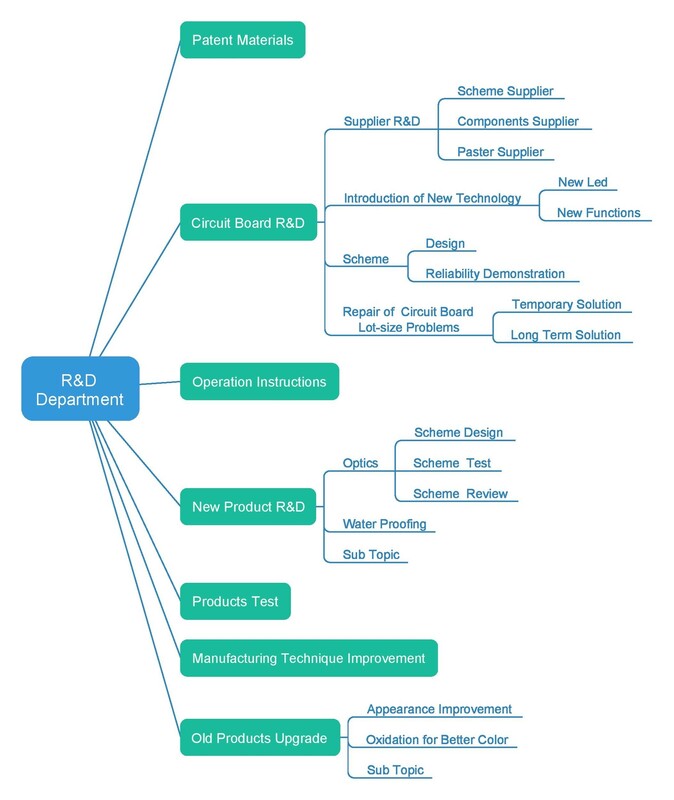 In this type, the project work deliverables are defined in terms of the functional or physical elements of the project, which are typically nouns such as module, automobile engine, antenna, etc. Nouns are usually parts of the products in the WBS so this type is also referred to as a Product Breakdown Structure or PBS. This is a time oriented type of WBS which is typically used on projects which would take up a lot of time. 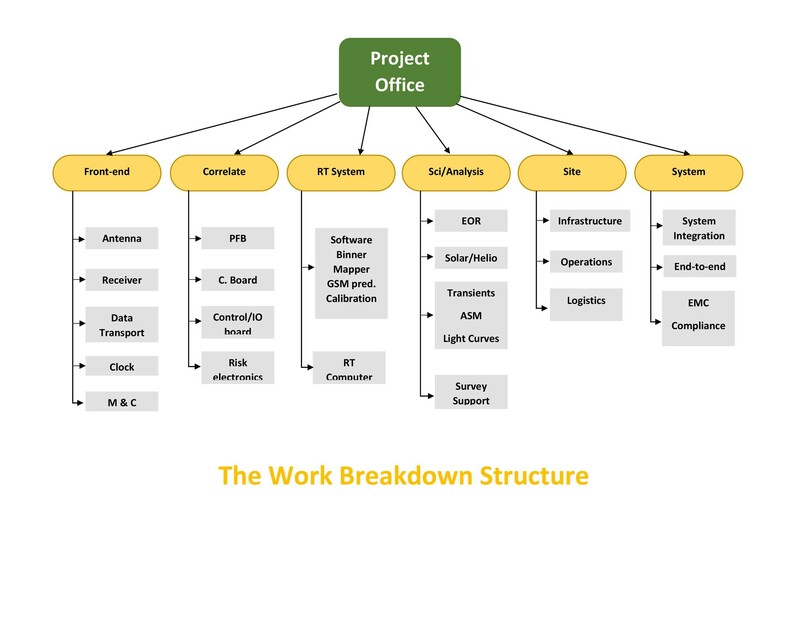 Projects which use this type of WBS are broken down into major phases rather than tasks and actions. In this type, phases are planned in detail then dealt with one at a time according to the ones which are most current. These types are also used and focus on the organization, location and the budget, costs or profits of the whole project. 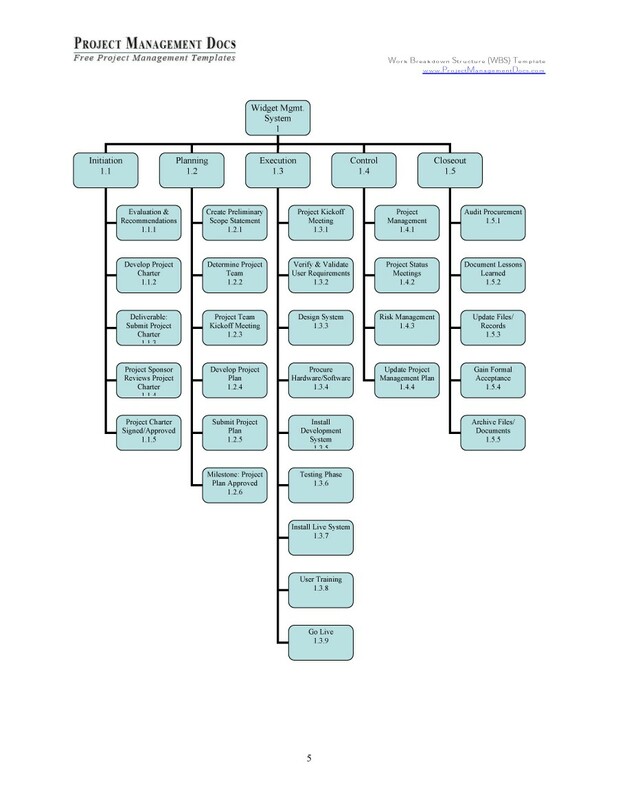 These types are not used as much as the others but there are a lot of work breakdown structure examples available online if you’d like to learn more about them. 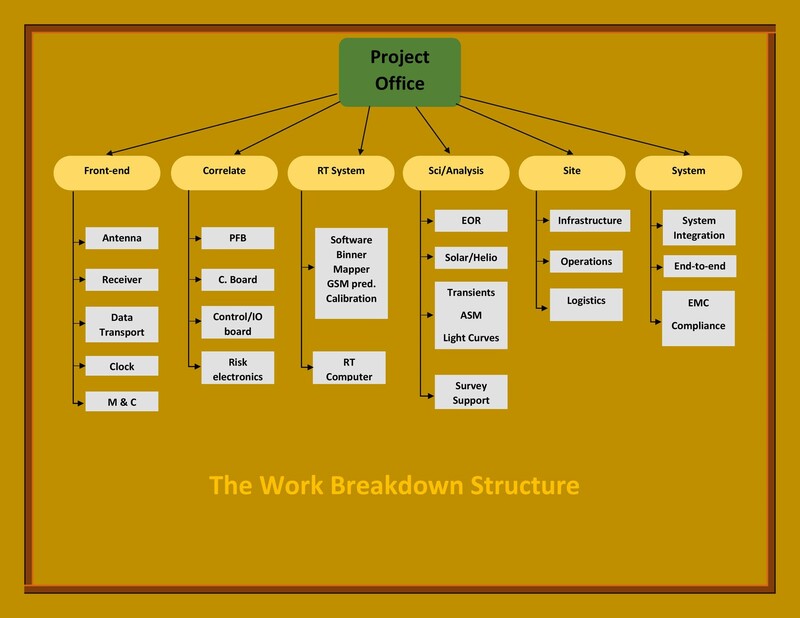 These are the most common types of WBS which are created and used by companies or organizations in order to organize and carry out their projects more efficiently. 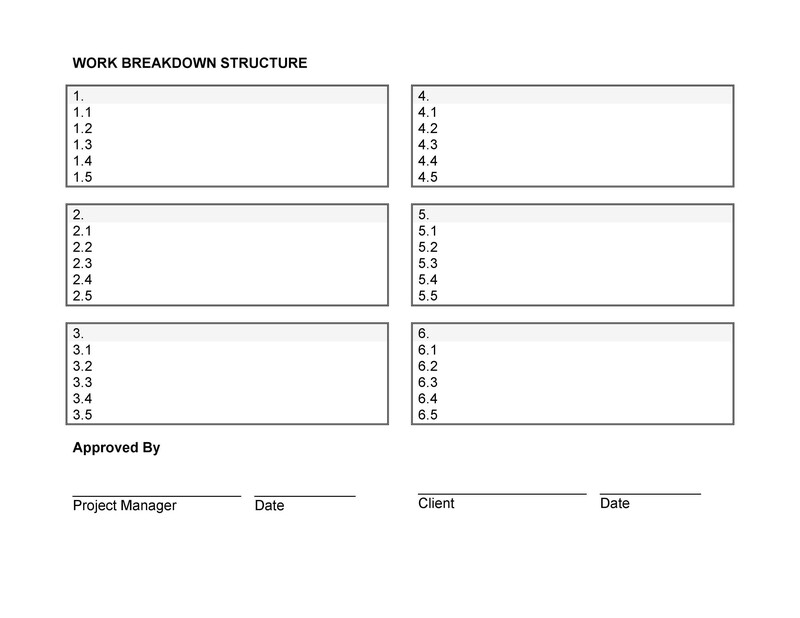 Now let’s move on to the different benefits of using a work breakdown structure for your projects. 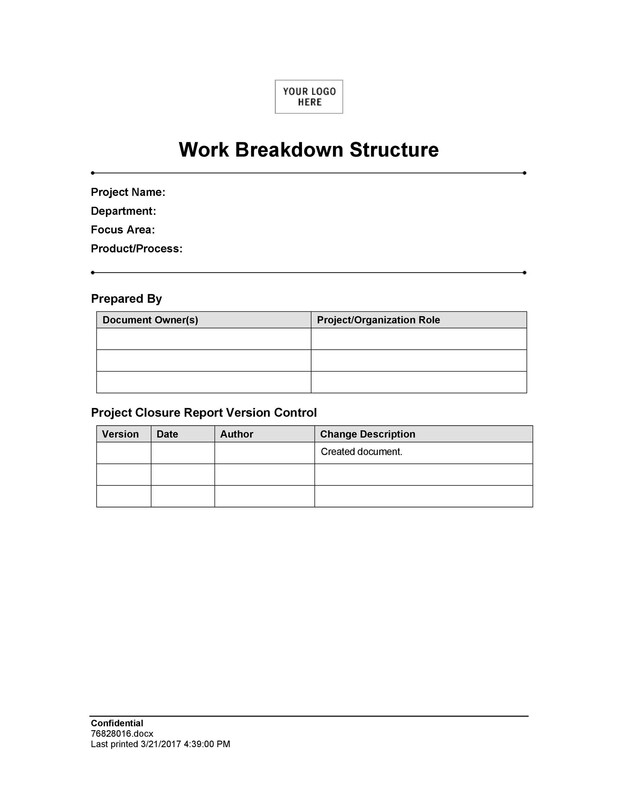 There are different benefits of using a work breakdown structure to effectively carry out a project in an organization. Projects take a lot of time, effort, and even money so when you are planning to start one, you have to make sure that it will be carried out well and completed in the right amount of time. When creating a WBS, the project manager and the team members would be forced to create detailed steps to be able to effectively define what needs to be done to be able to build a product or deliver a service well. Having vague steps would raise a lot of questions or might cause miscommunication or misunderstanding which is counterproductive to the project’s objectives. 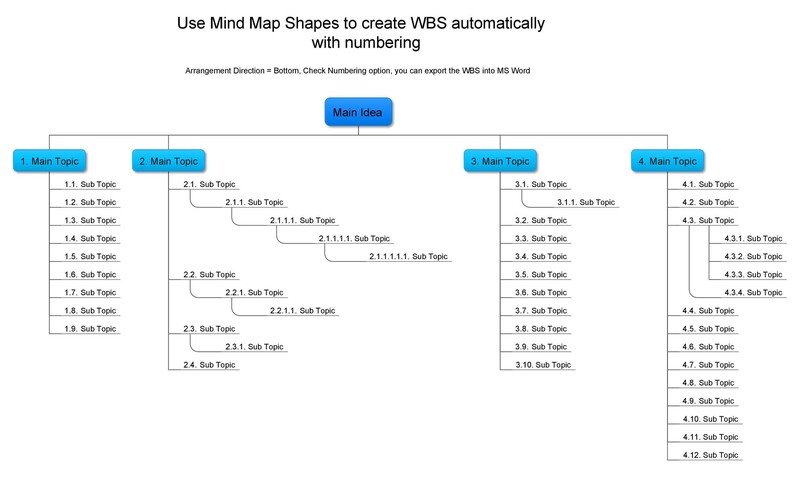 Creating a WBS early on can lay the groundwork for plotting a good schedule and planning the budget for the whole project. 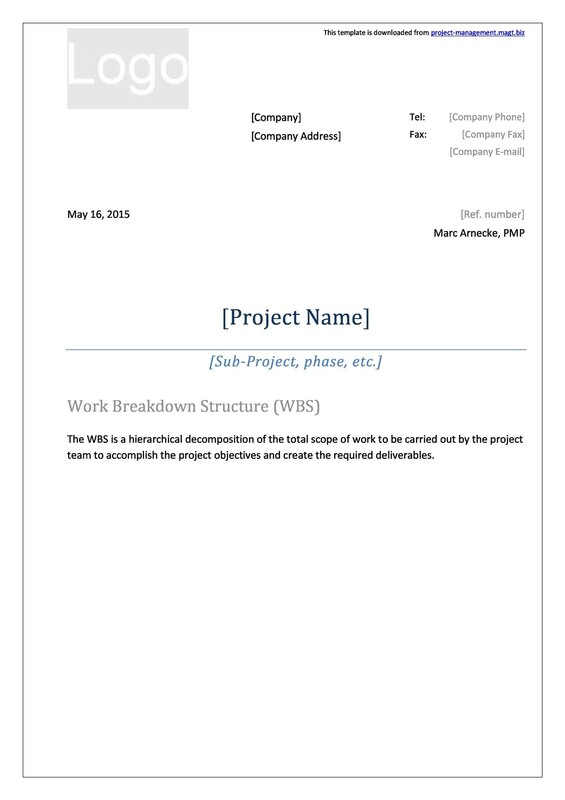 A good WBS would allow the project manager and the team to assign specific resources and budget to specific tasks. Knowing these tasks would also help in making a realistic schedule from the start of the project to its completion. The planning and creation of a WBS involve not only the project manager but the whole project team as well. The whole process of planning a project and creating a WBS could create excitement among the participants, hence encouraging their commitment to seeing the project through all the way to the end. Since the roles and responsibilities of the tasks are specified in the WBS, people are then held accountable for the tasks assigned to them. The WBS would be developed by everyone involved in the project, which means that each and every member is aware and is informed of everything involved in the project. Also, since creating WBS would be a team effort, a lot of input would go into how the project would be completed productively. The number of people to be assigned for each task can be established as well as the budget which would be needed. This would ensure that the project would be completed smoothly and the project team members would work at the peak of their productivity. 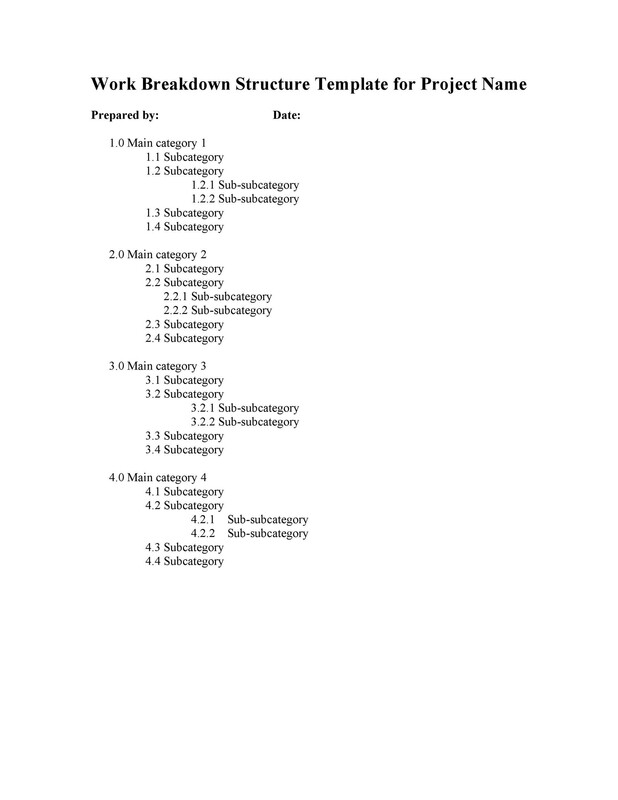 Progress in terms of which tasks have been completed, how much time would still be needed for the remaining tasks and if there are any budget or resources which have not been used in the completion of each task. This is very important so that the project manager knows that the project is progressing well and that it would be completed on time. These are the benefits of developing a WBS before putting a project into motion. Now let’s see the essential components needed when making a WBS. 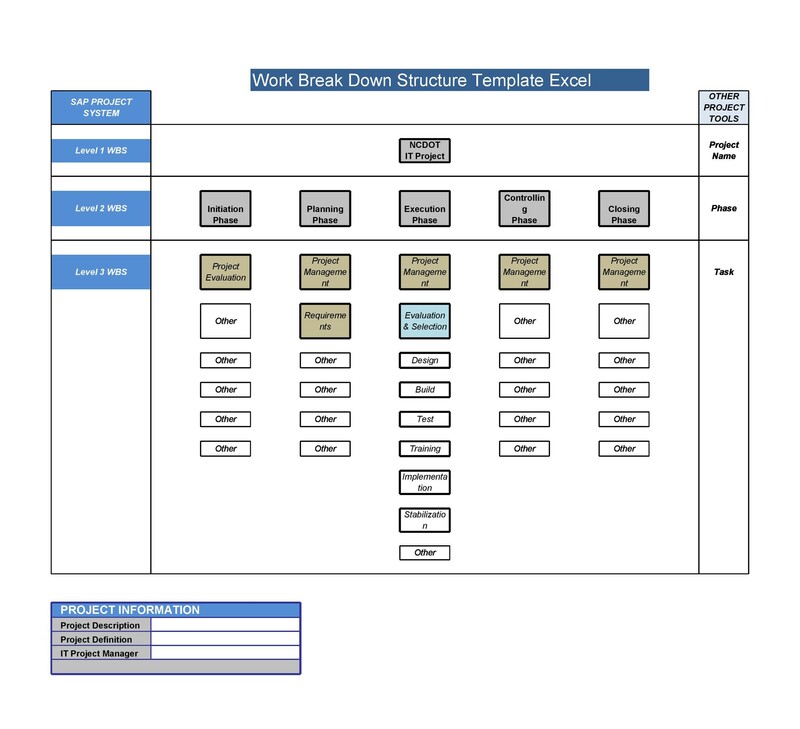 As you have seen, there are a lot of benefits to creating and using a work breakdown structure. 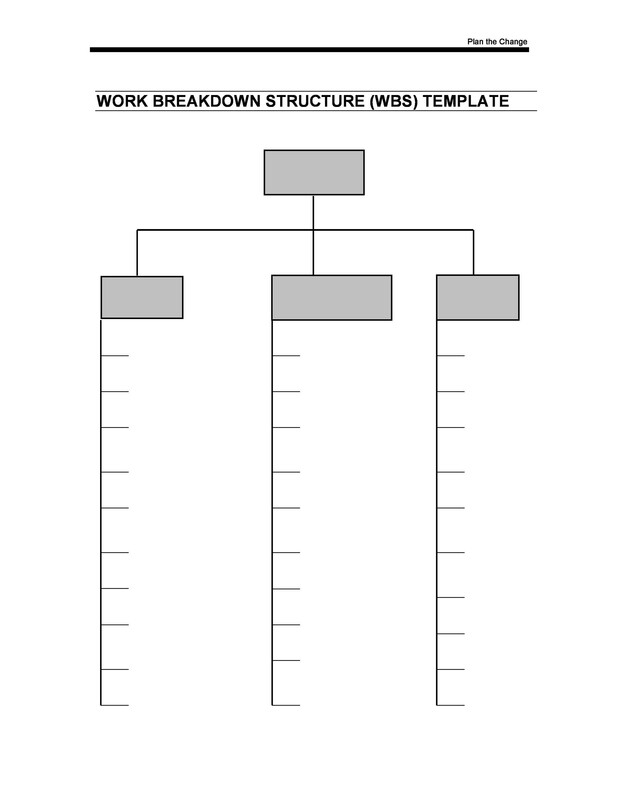 Now to be able to make your own work breakdown structure template, you would have to know the most important components which must be included in the WBS. Not having these or having incomplete components might affect the effectiveness of your WBS. Not only that but you might miss out a few important details which you might only discover by the end of the project. The primary reason for making a WBS is to simplify all the information and activities needed to complete a project into a precise collection of tasks to be assigned and carried out by the project team members. The tasks have to be specified so that the project manager would have an easier time to oversee how the tasks are being done as they are being done. All the tasks have to be specific, independent, and measurable and must have their own limits which are clearly defined. The work involved in the tasks bust also be included and no other non-project work must be part of it. 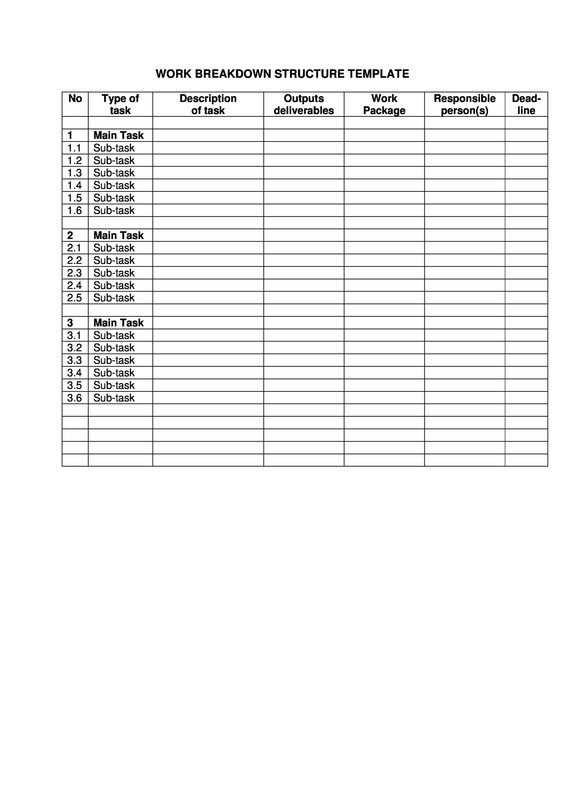 Since the tasks you include would have to be measurable, costs can be assigned to each of those tasks. Having a WBS would allow the project managers to effectively distribute the budget of the project according to the costs which are needed to complete all the tasks. It’s important to note that the total of all the combined task costs must not exceed the total cost of the project. 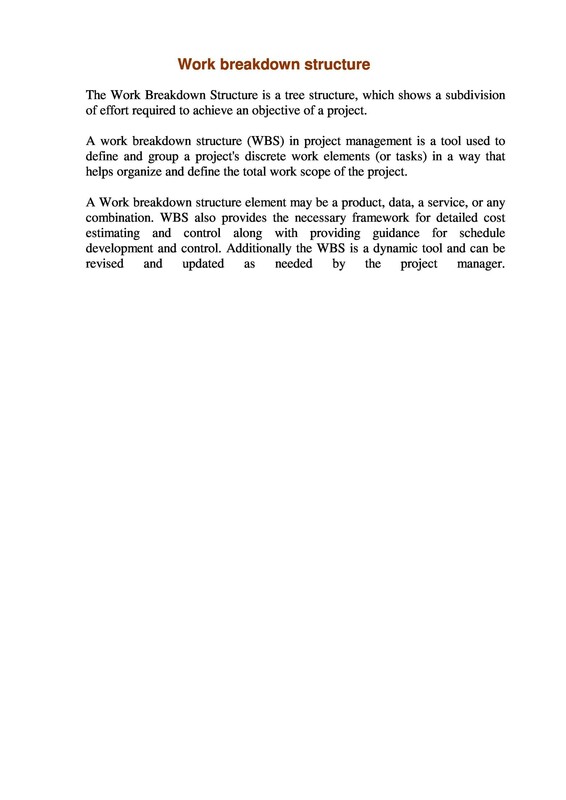 The schedule for the project and project tasks must be included in the WBS. This is important so that the project manager can keep track of the project’s completion based on the schedule. 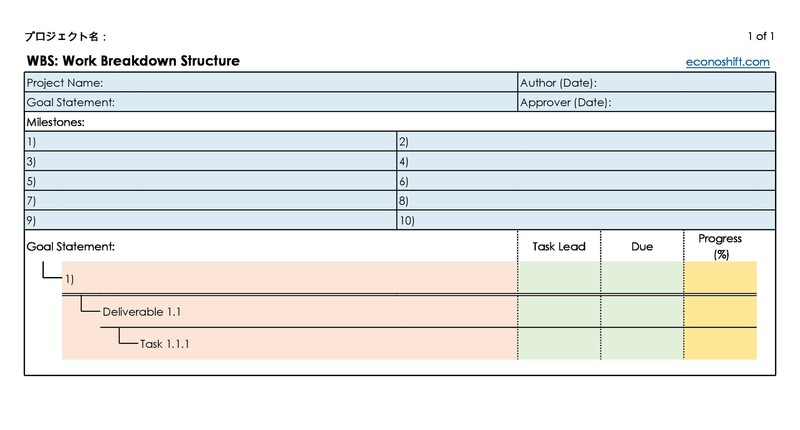 Since the project tasks should have clearly defined limits, the project manager can then see how the project is progressing by checking which of the tasks have already been completed. The project manager should also check the percentage of completion of each individual task since the tasks are also measurable. The scope of the project is everything which is involved in the completion of the entire project. The project manager must have already defined the scope of the project so that when you are making your WBS, the project can be completed without any having to do any extra work. Making a WBS would help establish the entire scope of the project as you would be making a list of all the tasks needed for its completion. The project team must be able to finish the project only by completing these tasks. A project can be deemed successful if by the end of it the objectives or purpose has been fulfilled. All the tasks in a WBS are meant to fulfill a part of the overall function of the project. A task can only be deemed complete when it is able to achieve its individual function. Thus, when all tasks have been completed, the project is already fully functional. Finally, the tasks in a WBS cannot be done without the efforts of the people involved in the project. 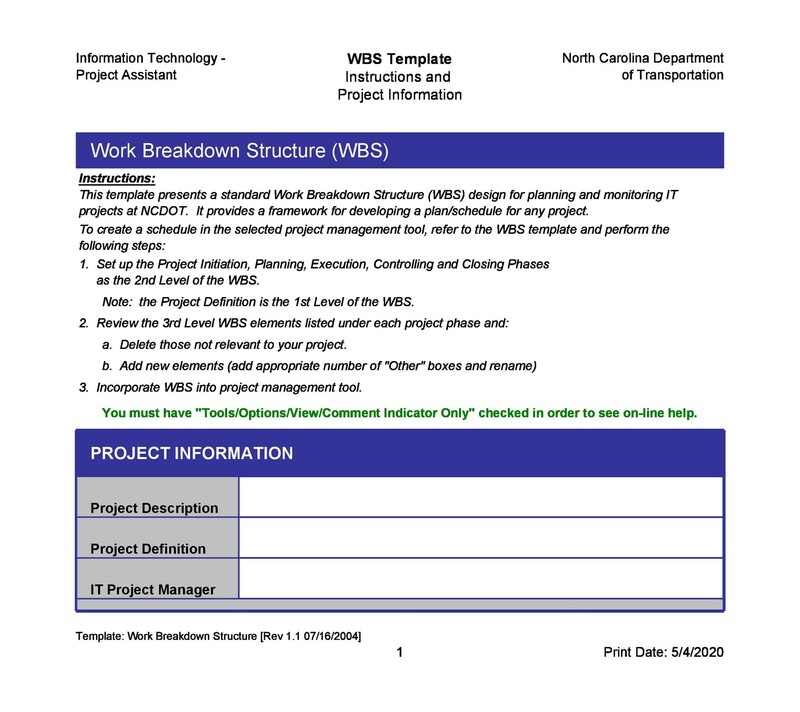 The WBS must contain all the roles and responsibilities expected of each team member or each unit assigned to a specific task. The project manager is in charge of assigning these responsibilities and the task manager would be responsible for making sure that all the tasks are done on time, within the budget and at the end of it, the project is fully functional. These are the most important components of a WBS and must be included in it. Without these, you might not have an effective WBS template and your project might be compromised. 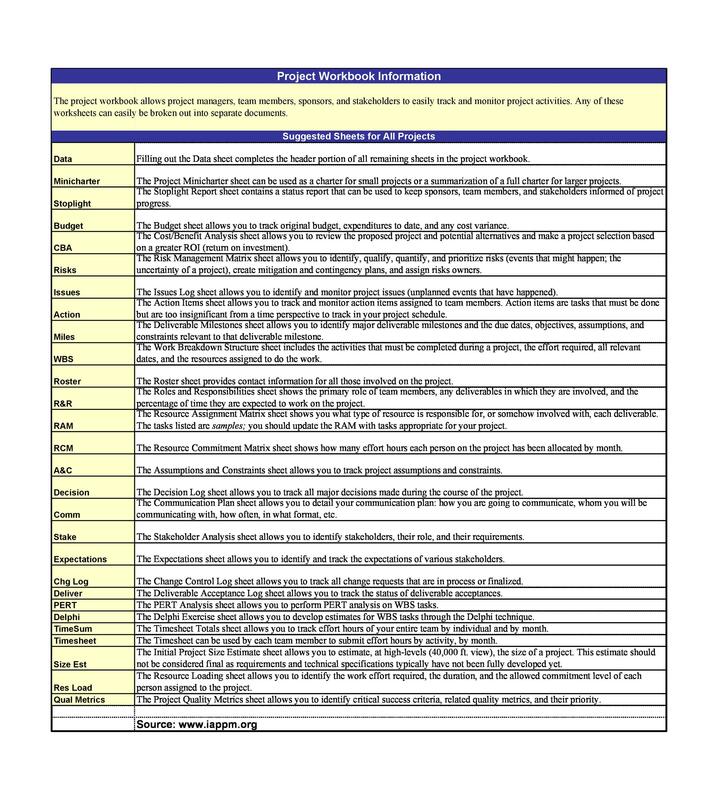 To help you out further, let’s discuss a few guidelines in creating your WBS so that when you start making one, you would have all the essential information needed. 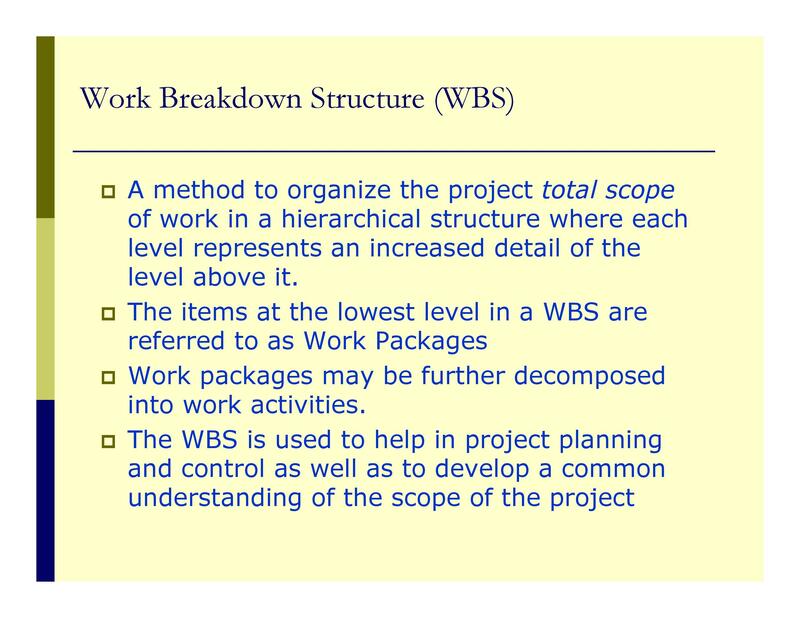 Remember that the topmost level of your WBS would represent the final objective or deliverable of your project. This is the most important part and the main purpose of your project. At the end of the project, this must have been achieved to be able to say that it was a success. 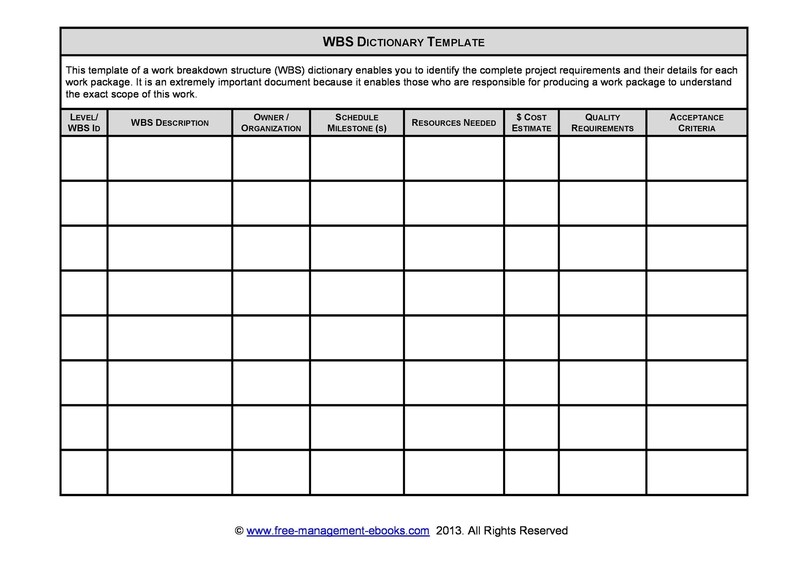 The different levels of your WBS would contain sub-deliverables. These would contain the work packages which you would assign to an individual, a team, a unit or a department in the organization. It’s essential to make clear all the specific responsibilities which go with the assignments so that the team members are well informed and would be able to carry out their tasks well. 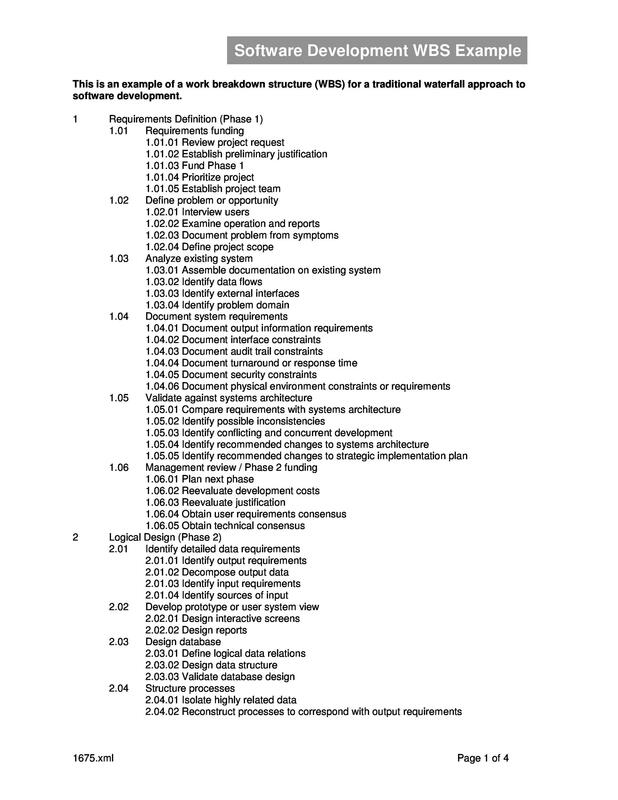 A work package would define the work needed to be done, the duration or time frame needed to complete it and any costs and resources needed to produce the sub-deliverables. It’s important to note that a work package should be completed in an excess of 10 days. Work packages are all different and they should be separate from other work packages in your WBS. 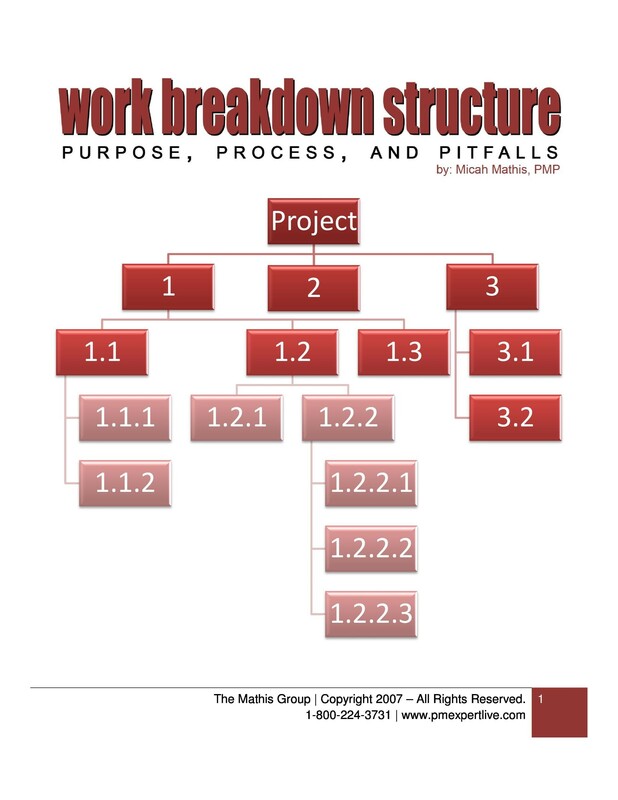 Aside from this, each work package must be unique and must not be repeated throughout the whole work breakdown structure. 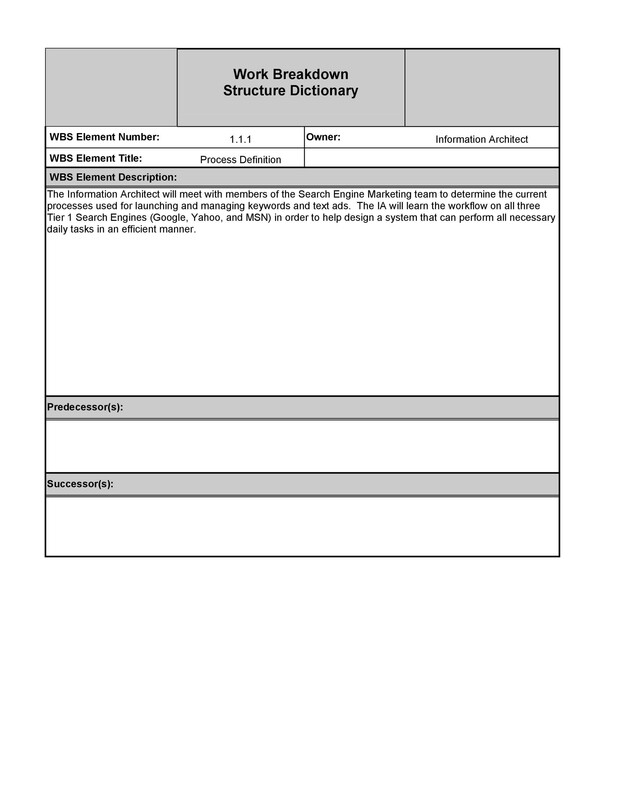 Each and every element in the WBS does not need to be defined and established to the same level. Some elements need to be explained in further detail while the simpler elements can just be stated if they are easily understandable. 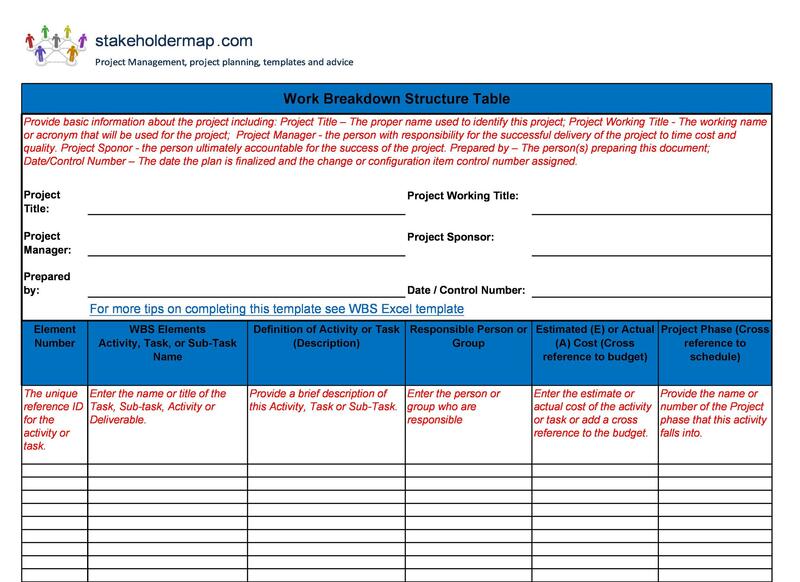 Keep these guidelines in mind when you are making your own template so that you will be able to create a WBS which is easy to understand so that your project team will be able to effectively work on completing your project. 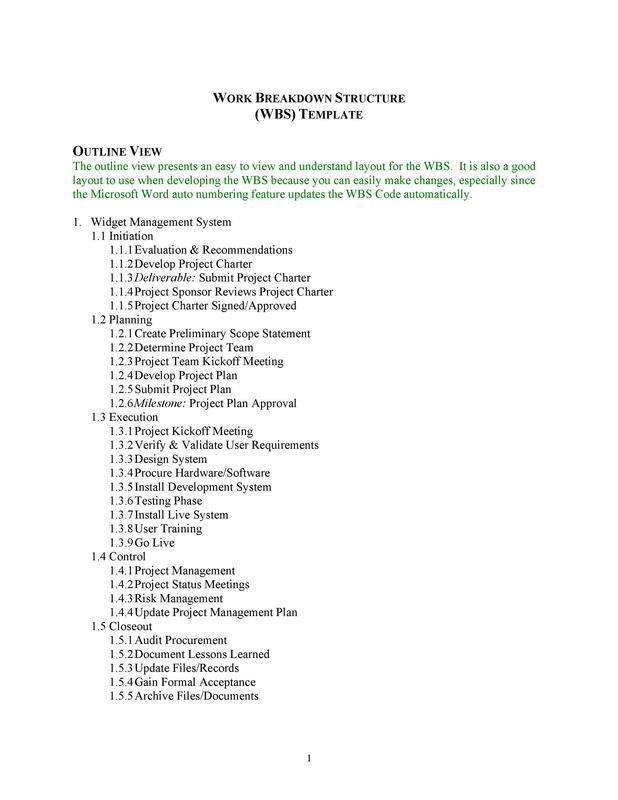 The very first thing to consider when making a WBS is to write down and record all the objectives you are trying to achieve in your project. These objectives could be anything from simple ones to the most complicated ones which would have a great impact on your organization. Think about the major objectives you would have for your project and list them all down. Then, you’d have to break-down those objectives into smaller and simpler tasks up until the point where you would start assigning specific tasks to the people involved in the project. At this point, you’d have to focus more on the project deliverables rather than the tasks. 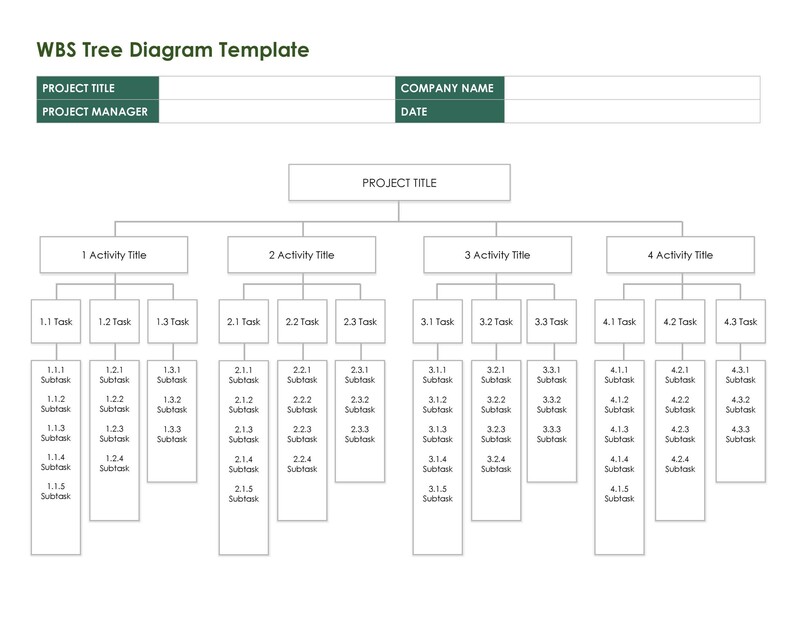 You can start by breaking down your project into phases and larger project deliverables. The 100% Rule which would include all of the work which would be needed in the completion of the project and the achievement of all the objectives. 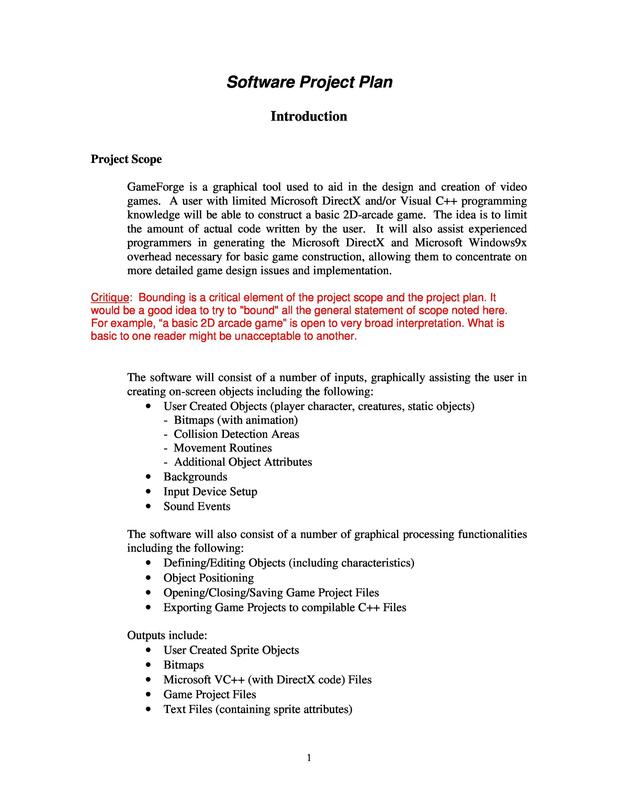 This doesn’t include any or all extra, additional or unrelated work needed for the completion of the project. The fact that everything is mutually exclusive. This means that you won’t have to repeat any of the sub-tasks or workloads twice so as not to breach the 100% rule. Repetition would also result in miscalculations and inaccuracies when you are trying to figure out any resources which you would need to complete your project. Focus on outcomes rather than tasks or actions. Concentrating on the deliverables instead of the tasks would make your WBS a lot more effective as it would call more attention to results rather than processes. The 8/80 Rule of Effort states that any workload must be completed not less than 8 hours but also not more than 80 hours of effort. 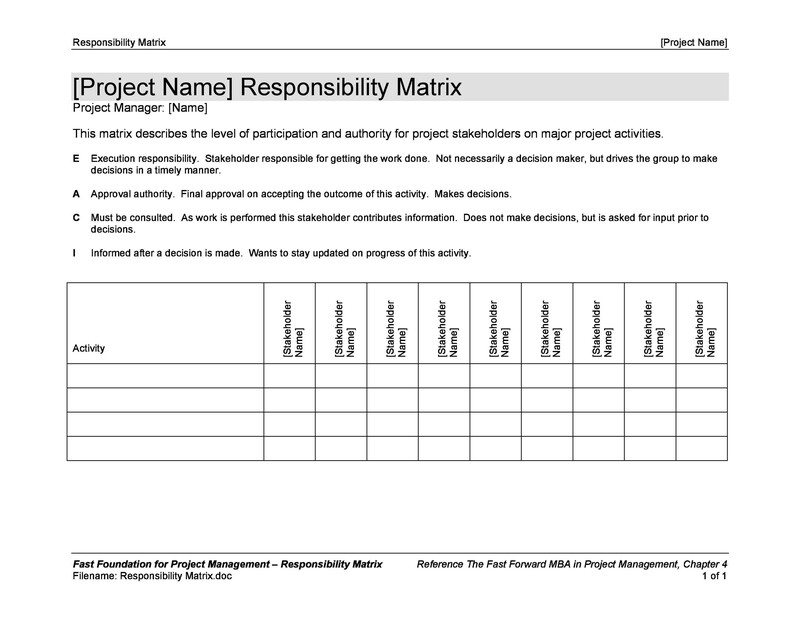 Simply put, if you report on your project every month, the workload should not take more than a whole month to complete. 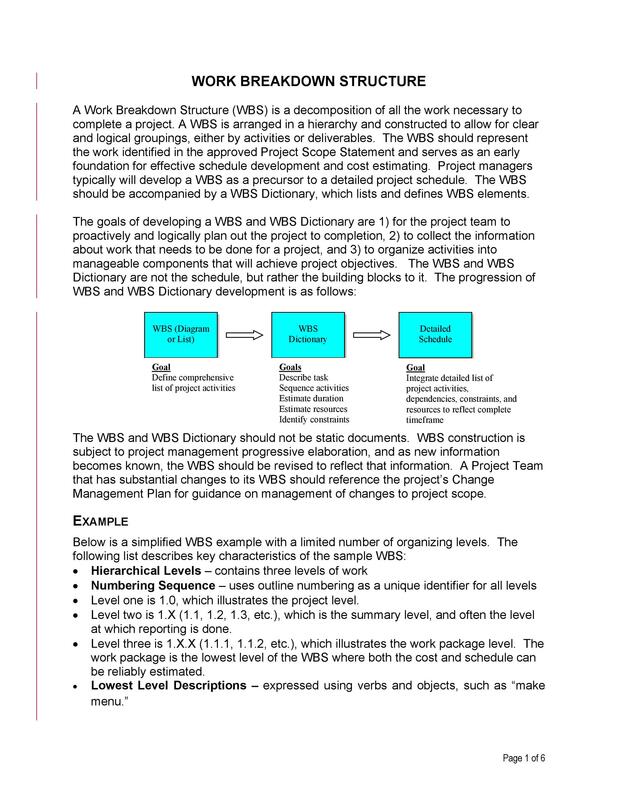 Typically WBS would be completed in 3 main levels. These main levels should be detailed enough and can be further subdivided if more details are needed. 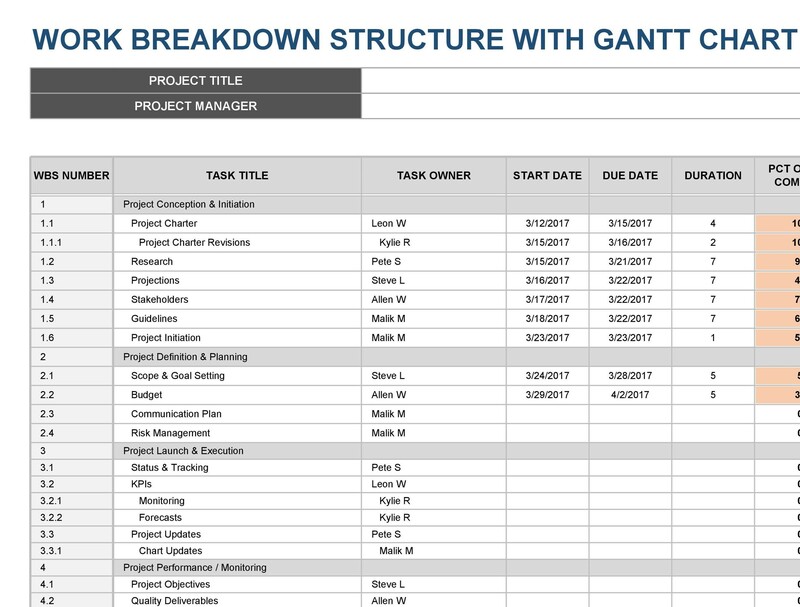 Finally, you would have to start assigning tasks to the project team members. Each and every work package has to be assigned to a specific individual or a small team of individuals to complete it. All the responsibilities should be clear and there should be no overlap of work.